In an announcement that did not give too much away the Virgin Group announced last week that its new three-ship cruise operation would now be called Virgin Voyages. Meanwhile, French America Line’s 4,225-ton 150-berth Louisiane (photo © Times-Picayune) entered service from New Orleans on Saturday. And container operator Hanjin Lines, some of whose ships carried passengers, has announced that it is closing its Europe-Asia business. Royal Caribbean’s New LNG Orders – Damen Reveals New Expedition Cruise Ship Design – More New Ships For Norwegian? Last week came news that from Royal Caribbean that it would be introducing a new class of mega 200,000-ton cruise ship to carry 5,000 passengers. But this class will be different because it will be dual-fuelled, relying mainly on LNG for its main proplulsion units by Caterpillar MaK. The first two ships are to be delivered in 2022 and 2024. Meanwhile, the Netherlands-based shipbuilder Damen has released details of a new expedition cruise ship design (above) that joins three or four others that are also now on the market. And from Italy come rumours of a new multi-ship order for Fincantieri from Norwegian Cruise Line. For further details please call The Cruise People Ltd in London on +44 (0)20 7723 2450 or e-mail PassageEnquiry@aol.com. 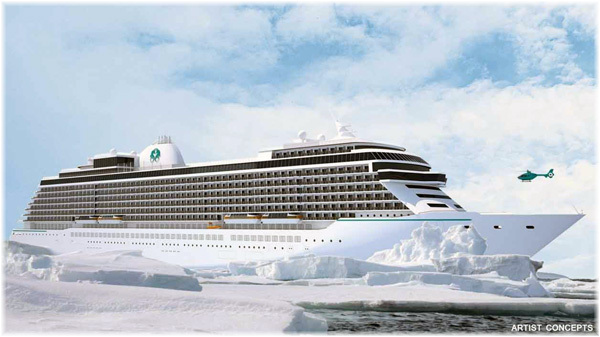 Artist’s concept of the first Crystal Exclusive class ship, now due in 2012. Over the past few weeks has come news that the various arms of Crystal Cruises are incurring delays or postponements in the delivery of new ships from what was originally announced. Now part of cruise operator Genting Hong Kong, Crystal shares quarters with Dream Cruises and Star Cruises in the pantheon of Genting cruise products. Dream Cruises’ first new ship, the 3,400-berth Genting Dream, delivers in Germany this Wednesday. And out of Malaysia comes news of Golden Hope taking its interest in cruise operator Genting Hong Kong up to 64%. Another container ship, another fantastic sea voyage. There is really no greater way to travel! My first cargo ship trip was three months earlier, from Germany to US, and it made me fall in love with the sea and this slow way to travel. This latest voyage, from US to Australia was equally wonderful, and happily a week longer. Three full weeks of great company, gorgeous views and excellent food – what more could anyone want? Boarding the ship was quite relaxed. It took me and the friendly taxi driver three tries to find the correct spot where I would get a shuttle to take me to the ship, but after that it was smooth sailing. I got to the ship and hallooed the deck hand in charge of boarding, who helpfully came down and carried my luggage up the gangway to the ship. The third officer came shortly and took me to the ship’s office where we went over paperwork and the like. Then he took me to my cabin, and I was free to settle in. My cabin was all in one room, so it was smaller than the luxurious owner’s cabin on the Jamaica. But I had my own bathroom and a window, and I was at the end of the corridor in a nice quiet corner. The Cap Capricorn was structured very much like the Jamaica, with several decks for social spaces, crew and passenger cabins and the bridge in one super structure toward the rear of the ship. My cabin was on deck F, which was two decks below the bridge and one above the deck with the laundry. Perfect. My cabin faced aft, which I wasn’t too happy about, but I saw some fabulous sunsets and sunrises (yes, both) from my window, so came to appreciate the view. We were only three passengers on this trip, and the other two were a couple in their 70s. Like the passengers on the Jamaica, my fellow travelers were also very fond of travel and had in fact spent most of their lives living in fascinating places and traveling all over the world. Great company! The crew was quite mixed this time, mostly Indian, with Polish, Filipino, Romanian and Chinese mixed in. The crew overall didn’t socialize with each other much, so there was no partying like on the Jamaica. But I had great time with the other passengers, we spent much time walking around the deck, having a pre-dinner drink or watching movies after dinner. Oh and the food was fantastic! Due to the many Indians onboard, there was usually a vegetarian Indian option available at meal times, which kept me very happy. Our Romanian cook was also kind enough to cook something special for me when there otherwise wouldn’t have been anything suitable. So I ate really well, which gave me extra zest for burning up the calories up on the deck! Crossing both the equator and the international date line brought some excitement to our journey. Of course the sea looks much the same on both sides of these imaginary lines, but few people ever cross either at sea. We also successfully outraced a typhoon less than a week into our journey, and actually enjoyed mostly calm seas and sunny skies during the three weeks. Unlike on the Atlantic crossing, I actually saw about a hundred dolphins overall! And lots of flying fish, scattering away from our path. On one of the last days I also had an unconfirmed whale sighting. It was all so quick that I didn’t get a photo, but it was definitely larger than a dolphin, traveling alone rather than in a pod and moved far too slow for a dolphin. And best of all, in Auckland we loaded a half long container with five horses onboard. The crossing from New Zealand to Australia and back usually includes horses onboard, and the horse wrangler was thus a regular visitor. For us passengers this was new and exciting and much time was spent checking out the horses and asking the handler questions. No, the horses don’t mind the ocean swells. Yes, they sleep standing up. The pee and the poo goes overboard when away from ports. No, the horses do not need to get out of their stalls in the five day trip. Nor do they need constant supervision or company. The horses were really chill about the whole thing and absolutely no trouble at all. This was the first time I had a port of call, and was happily able to meet some old dear friends for lunch in Auckland. After lunch we had a nice little walk around town, as between docking, formalities and the lunch, there was really only two hours until boarding time. I had spent four weeks touring New Zealand some years earlier, so on this trip I settled for only a short visit in favor of maximizing my time in Australia. I will miss all my new friends from the Cap Capricorn, but I look forward to all new adventures in Down Under! For further details of booking a cargo ship voyage please call Miri Lopusna at The Cruise People Ltd in London on +44 (0)20 7723 2450 or e-mail PassageEnquiry@aol.com.